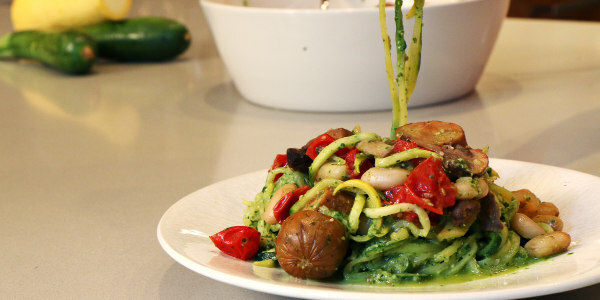 As part of TODAY's "At Home with Natalie" series, Natalie Morales shares one of her favorite healthy recipes: zucchini pasta with pesto. Watch the video to learn more about why Natalie loves this dish. Like most other people, I try to maintain a healthy diet. This dish came about as a way to satisfy pasta cravings in a more nutritious way, and this recipe is a product of trial and error. It's one of my favorite original recipes!